I watched your video on youtube named Punched card reader. Could you post the code for me. I did discover your picture while browsing the Net. I would like to introduce it into our French translated tutorial on Trinket. Please use it, glad to be helpfull. That proteus model is cool…I have been using proteus for years but never knew about the hidden page feature…can you send me the project file? I currently run 8.1SP1. Appreciate it! I simply stuck an tiny85 and some other bits for simulation but it’s ugly. Hello my friend, I made the punched card reader found on their website, I presented it in college, with due credits, I want to make some modifications to it, I can use it. If asking for permission to use it, just serve yourself, thanks for reading Arduining blog. I want to make some online tutorial for my upcoming blog, I liked the trinket pin diagram you have prepared. Can you tell which software did you use to prepare them? Thank you for prompt answer. I saw similar pin diagrams in few other TI MSP430 forum and thought of having some feature in PCB software that I could use. Hello, I am currently doing my GCSE Technology project and I am producing a similar product to your Parking Lot. The only difference being I intend to create a modular system that can monitor the intake of different types of vehicles and their corresponding spaces. Would it be OK if I was to use your code as an outline for my project and modify it slightly. I would give you credit in my final course work. You are free to use it. Hello, I have made several Arduino projects but never with Trinket. Recently I tried porting a simple light sensor program that reads analog voltage from a LDR voltage divider but the behaviour is inconsistent. I am using a photocell with a 2.7M in series as divider between 3v and gnd and I am reading from analog 1 – I really don’t know what I am doing wrong here… seems simple enough. Could you perhaps show me simple code example? How do you see the sensed value, do you have a display or a serial terminal? My understanding is that you can’t call the terminal window with a Trinket. Currently I cannot see the value. I have tried to establish what is the maximum reading by setting a threshold – “reading = analogread(Photocel) – IF reading > 1000 then digitalwrite (LED, HIGH)” – (this is NOT the actual code but I hoe you get the idea) this way I get to know what is being read in normal light conditions. What method of monitoring a serial terminal do you use with the trinket? 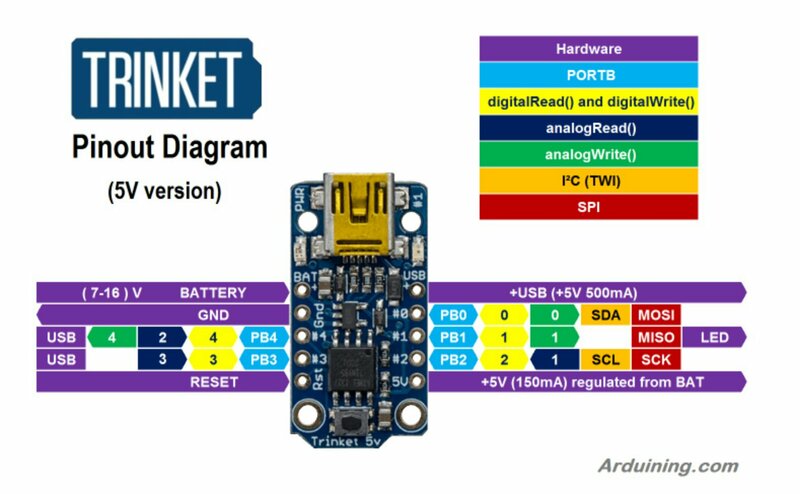 Juan, check the post “Serial bit banging with Arduino Trinket” in Arduining. Check also other posts about Trinket. You can also see the serial data using a Serial Terminal like PuTTy or Tera Term with a USB/TTL serial cable. sir can i ask for the complete requirements/components that you used for this project? Can not identify the project you are asking. Its about the toll tax barrier sir.